Food! Love these prompts! Thanks Frank. 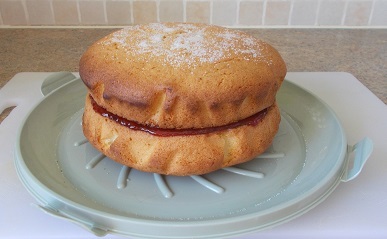 When Hubby had a stab at being self-employed, if he did a little job for my friends at the bank, apart from reimbursement for any spares, he didn’t charge them for fixing anything, cheerfully suggesting they could pay him in CAKE! Marmalade cake was his favourite. It wasn’t that I didn’t or couldn’t make cake, just that I didn’t do so very often for just the two of us, so it was very much a case of my Dad’s joke about pending visitors if I started baking! 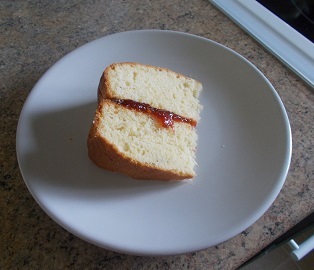 However, for a victoria sponge, he has no such problems and I manage to make it last at least 5 days. I weigh everything pro rata to the weight of the eggs. Three eggs equate to around 7 oz. Plus 2 tablespoons of boiled water in the final beating. 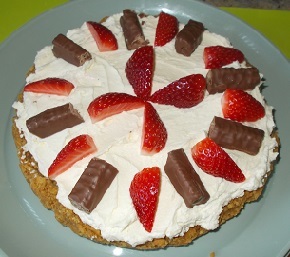 This entry was posted in blogging, Challenge, Photos, recipes and tagged cake, fpj-photo-challenge. Bookmark the permalink. Cheesecake is one of my favorites. I make one that will serve 20 people. I understand the reflux from the richness of the cheesecake as this happens to me too. The sponge do you bake two cakes or one and slice it into two. I split the mix between two greased and lined 7″ baking tins, then when cool, sandwich the two with jam. It takes about 20 minutes to cook as two individuals. Hubby is rather partial to it. I love the looks of that sponge cake. It could take it with jam or plain. Thank you. You could also spread jam on the top and sprinkle with coconut, or sandwich together with cream or butter icing.